We want to share our family's passion for pizza with you. We bring you authentic pizzeria pizza made from the finest ingredients: fresh basil, olive oil, San Marzano ripe tomatoes & fresh mozzarella. Our pastas and sausages are homemade. We hope that you will enjoy the quality and great taste of our food as much as the family does. 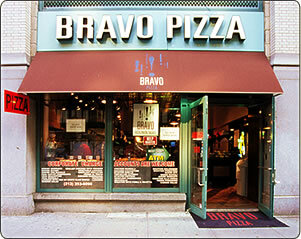 In 1985, we created our original recipe and opened a small pizza shop. When our pizza got rave reviews we expanded. As our customers keep coming back for more and spreading the word to others, we continue to grow. We hope that you will enjoy our pizza and grow with our family. If you can't make it to us - no problem -we'll come to you! Click on the Order Online tab above and we'll delivery right to your home or office. And be sure to make use of our advance order feature to ensure that your food is delivered or ready for pick up exactly when you want it.